What Is DA Form 3508? DA Form 3508, Application for Remission or Cancellation of Indebtedness is a form used for evaluating whether a service member's debt to the United States is eligible for remission and cancellation. 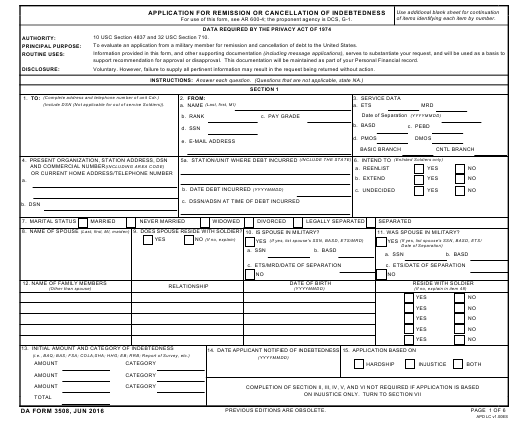 The Department of the Army (DA) released the latest version of the form - sometimes incorrectly referred to as the DD Form 3508 - in June 2016. An up-to-date DA Form 3508 fillable version is available for download and filing below or can be found via the Army Publishing Directorate website. A wide range of debts may be considered for remission and cancellation. A hardship or injustice may serve as the basis for filing the application for remission. How To Fill Out Da Form 3508? of items identifying each item by number. For use of this form, see AR 600-4; the proponent agency is DCS, G-1. 10 USC Section 4837 and 32 USC Section 710. To evaluate an application from a military member for remission and cancellation of debt to the United States. support recommendation for approval or disapproval. This documentation will be maintained as part of your Personal Financial record. Voluntary. However, failure to supply all pertinent information may result in the request being returned without action. (Include DSN (Not applicable for out of service Soldiers)). 9. DOES SPOUSE RESIDE WITH SOLDIER? 10. IS SPOUSE IN MILITARY? 11. WAS SPOUSE IN MILITARY? repayment of money borrowed for any purpose, doctor bills, hospital bills, etc. DO NOT include living expenses or allotments. NOTE: If payment of a debt is not on a monthly basis, write "O"
in column f and describe arrangements in Section VII - REMARKS. 48. USE THIS SPACE AND ADDITIONAL SHEETS IF NECESSARY TO SUPPLY ANY OTHER PERTINENT INFORMATION AND TO CONTINUE YOUR ANSWERS TO PREVIOUS ITEMS. Section I requires basic information about the applicant. This includes their name, rank, SSN and e-mail address along with information about their service (expiration term of service, date of separation, basic branch), their current home or organization address and the location where the debt was incurred. Applicants must specify their marital status and their spouse's personal information, list all family members and their personal information as well. The form must also include the initial amount and category of indebtedness and the basis for applying . The DA 3508 Form is valid under any chosen option. Section II requires specifying the amount of income the applicant has, and - if they are married - their spouse's income from any sources. Section III is for listing all expenses and their total amount. Section IV is for listing installment contracts and other debts. It requires the name and the address of the creditor, the purpose of debt, the current allotments, any unpaid balance and the amount due monthly. Section V is reserved for additional data. This includes details on the date of bankruptcy, any received enlistment and reenlistment bonuses, information on saved cash, any savings or other bonds, expensive purchases and aby real estate or vehicles in possession. Section VI summarizes the money flow of the applicant. Any additional information may be entered in Section VII, reserved for remarks. The DA Form 3508 also allows using an additional blank sheet for continuation if the space provided on the main form is not enough. Section VII, Verification, requires the signature of the applicant and spouse with a date of signing the form. This section must also contain the verification form an immediate commander along with their name, the date of signing and signature. Section IX is used only by the Financial Assistance Office (FAO) or United States Property & Fiscal Office (USPFO).